Orad and Primeview will host an open house in New York City, to showcase the latest advancements in video wall processing and control using Primeview's Display Solutions together with Orad’s PowerWall and TDControl systems. A 55-inch narrow LED LCD video wall. Unlike traditional video wall processors, Orad’s systems enable users to manage multiple display areas of different size, resolution, and aspect ratio with real-time graphics, data integration, video playback, live video insertions, and 3D effects without adding operators. 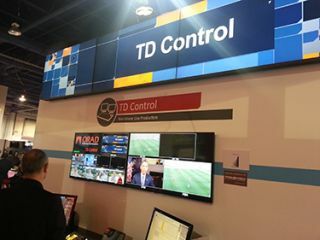 TDControl and PowerWall are cost effective when planning a new video wall installation. Major broadcasters such as The Weather Channel and ESPN are utilizing TD Control to create dynamic studio environments and live event production. PowerWall is available in configurations up to 16K outputs, and is a cost effective way to provide dynamic content to large studio and digital signage video walls. Demos at Primeview’s New York City showroom will last approximately an hour each, and are by appointment only on August 4-6, 2014.